Palu, Indonesia – It was two hours before sundown and a dozen or so women, some in full black headdress, stood weeping silently, watching the men carry the coffin of a family member whose body was retrieved six days after a deadly earthquake struck this city. Moments later, a female Christian pastor led the burial rites, while many in the group whispered Muslim prayers before the white casket – bearing an image of the Last Supper on both sides and a small cross on top – was lowered into a dirt grave in a patch of a public land by the hillside overlooking Palu and the bay. Rismawati Hutauruk, 63, was killed when she fell into a crack in the earth that opened up during the disaster, her sister Irma Frans told Al Jazeera. Irma said Rismawati died a Christian, leaving behind her husband and their two sons who are Muslims, and three daughters, all Christians; as well as siblings of mixed religions. Irma herself is Muslim. On the more conservative Muslim island of Sulawesi, where Palu is located, Rismawati’s family may not be the norm. But in that moment of grief during the funeral, sectarian distinctions were the furthest from the minds of her family members. Rismawati was among the more than 1,550 people killed when the magnitude 7.5 quake rocked the city of 350,000 exactly one week ago. The powerful earthquake triggered a cascade of disasters, including a deadly tsunami and widespread soil liquefaction that buried an estimated 1,000 people and homes and igniting fires. More than 2,500 victims were injured and 70,821 are displaced and in need of aid. Citing village leaders, Sutopo Purwo Nugroho, Indonesia’s disaster management agency spokesman, told reporters late on Thursday that the number of victims of the liquefaction – when a quake turns earth to water – in Palu’s Balaroa and Petobo districts could be as high as 1,000. So far, dozens of bodies have been retrieved from both areas. Rismawati was from Balaroa. Search-and-rescue efforts continued in the two districts on Friday. But volunteers face difficulties in finding people as buildings are buried in metres of mud and debris. Heavy equipment also risks getting stuck in the mush resulting from liquefaction. A hundred metres from Rismawati’s burial site, the government dug a mass grave for many of the unidentified victims of the earthquake. Under the waning afternoon sun on Thursday, several masked volunteers continued to carry body bags, carefully piling them on top of each other in a deep hole excavated by a lone backhoe. The smell of rotting flesh swirled around the site. Volunteers told Al Jazeera at least 74 bodies were buried there on Thursday alone. After volunteers finished hauling the body bags into the mass grave, Asdar Junaidi, an imam and volunteer from local humanitarian group Dompet Dhuafa, led funeral prayers for the deceased. Since the mass grave was dug, Asdar told Al Jazeera he has led prayers for more than 300 victims. Volunteers from his group are also involved in various aspects of the humanitarian operation, including medical services, body retrieval and burials. Imam Asdar, who is from the city of Makassar, said when he heard of the earthquake in Palu he immediately packed his bags to volunteer, knowing his help was needed. During previous disasters in Indonesia – such as the August earthquake in Lombok, where more than 800 people were killed – he also officiated burials. “I feel a sense of duty to help. It’s my way to give them some dignity in their death, especially in this kind of situation where nobody is claiming their remains,” Asdar said. “We feel sad about the situation, but this is the best that we can do – to offer them prayers,” regardless of what religion the victims were, he added. Azis Tilu – a first army lieutenant leading military volunteers who are recording the number of burials – admitted to Al Jazeera that no DNA testing was being carried out on the victims, meaning they will never be identified. Because of the advanced stage of decomposition, he said there was an urgency to bury the bodies for health reasons, and there was no time to wait for family members to claim the remains. Among those who witnessed the mass burial on Thursday was Tere Pratiwi, 39, a volunteer from another Indonesian humanitarian group, Komunitas Relawan Kemanusiaan (KRK). A total of nine volunteer members from Tere’s organisation were killed or remain missing following the disaster. Tere said the KRK members were at a festival near the coast of Palu when the earthquake and tsunami struck. Two bodies were recovered, while seven staff haven’t been seen since. Family members pleaded with her to help find their bodies, so she and two others from the group checked on the mass grave seeking any information, without success. 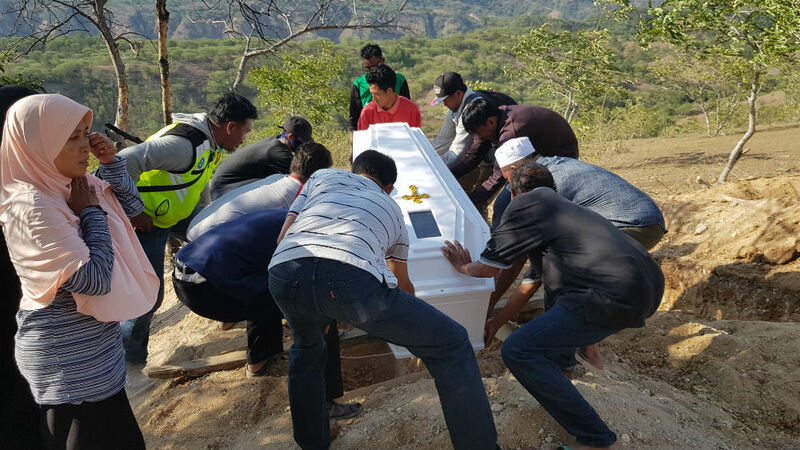 Back at Rismawati’s final resting place, her youngest daughter Lydia, 11, rested her right hand on the mound of dirt as she said her final goodbye. Tears continued to flow from her eyes. Lydia’s father Jamaludin and her siblings sprinkled water on the dry earth where their mother was buried, placing a stick on top to indicate its location.